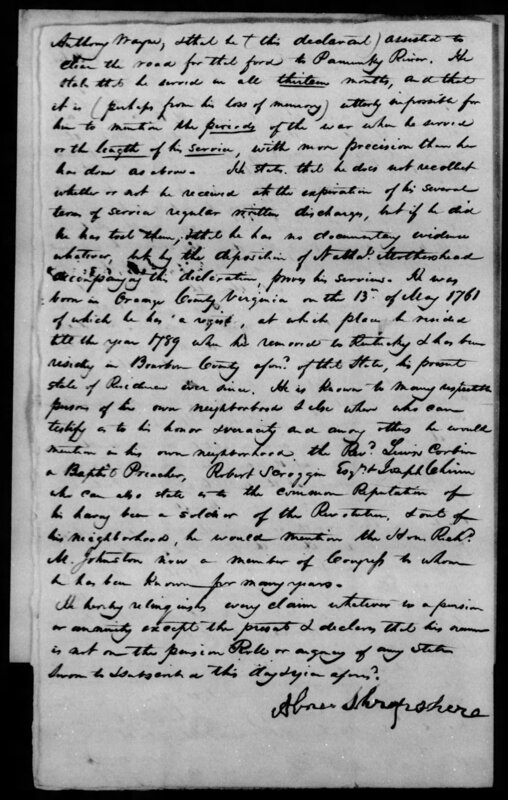 Several months ago, I posted a blog about Ritchey’s 3rd great-grandmother, Susan Stringer Bennett, who was a Real Daughter of the American Revolution. That is to say, a woman whose father was in the Revolutionary War. Today I want to introduce you to another Kentuckian who was also a ‘real’ daughter. Elizabeth Susan Shropshire was the daughter of Abner Shropshire and his wife, Susanna Foster. She married Nathaniel Switzer, September 18, 1838. The couple had at least six children. Those listed in census records – William Asa, Susan Arabella, Ann Rebecca, Howard, Walter and Frank. From Abner Shropshire’s pension application we find he served in the state of Virginia in the months of January and February 1779. He met the prisoners taken under Captain John Burgoyne at Fauquier Church and returned with them to Albemarle Barracks, where said prisoners were stationed. His captain was James Hawkins, his Major was named Barbour. After this month of service, he was drafted and served three months under the same officers. He was stationed at Albemarle Barracks as a guard over the prisoners of General Burgoyne. Captain Frank Taylor was commanding officer of the barracks at this time. He served another three months in the same capacity under Captain Thomas Porter. In 1781 he served two tours of three months each, in the Virginia Militia, under Captain George Waugh. Major Barbour of Orange County, Virginia, was also in command. In the spring of 1781 the troops to which he belonged met at Orange Court House and marched to Richmond, thence to Williamsburg and back to Richmond, the residents of which had deserted the city. From Richmond he marched to Manbin Hill (?) camp; then to the Racoon Ford of the Rappahannock in Orange County, where his forces met those of Major Anthony Wayne, and assisted to clear the road from that ford to the Pamunkey River. His full service amounted to thirteen months. Abner Shropshire was born in Orange County, Virginia, on the 13th of May 1761, for which he has a receipt, and at which place he resided until the year 1789 when he removed to Kentucky and has since resided in Bourbon County of the aforementioned state. Abner Shropshire married Susanna Foster October 8, 1791, in Bourbon County. Jeremiah Foster was bondsmen, possibly Susanna’s father or brother. Abner Shropshire born May 13th, 1761. Susannah Shropshire was born June 28th, 1774. Ditto & ditto married October 13th, 1791. Charles Shropshire, our eldest son was born December 3, 1792, and departed this life January 13, 1793. Jeremiah Shropshire born February 8, 1794. John Shropshire born May 7, 1796, and departed this life June 6, 796. Hubbel Shropshire was born August 24, 1799. Nancy Shropshire was born January 5, 1800. Walter Shropshire born November 11, 1801. Asa Shropshire born November 16, 1803. Lucindiana Shropshire born March 4, 1806. Harvey Shropshire born August 25, 1808. Benjamin Shropshire born August 11, 1811. Lucindiana Shropshire departed this life September 10, 1812. This is all of record in last family Bible sent this day to Harvey Shropshire of Leesburg, Kentucky. W. R. Evans, October 4, 1879. 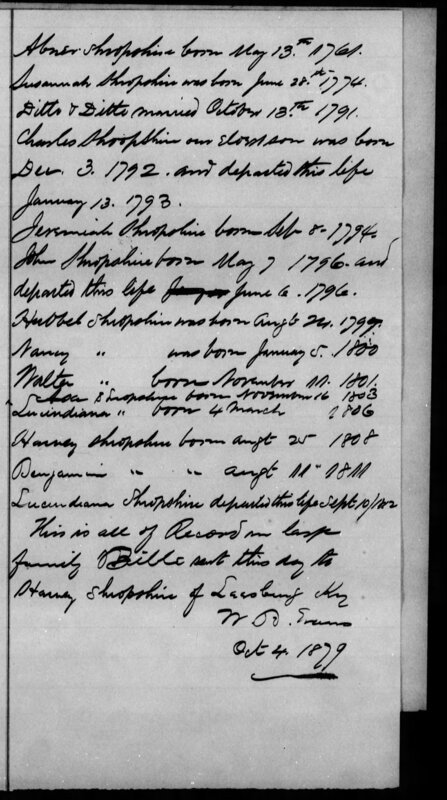 The last two children are not listed in the family bible – Oliver Perry Shropshire, born October 13, 1813; and Elizabeth Susan Shropshire, born October 21, 1816. However, two family bibles were submitted as proof for the pension application. Perhaps the latter two were listed in one of the bibles, or, as sometimes happens, the last children may have not been added to the bible at the time of their birth. 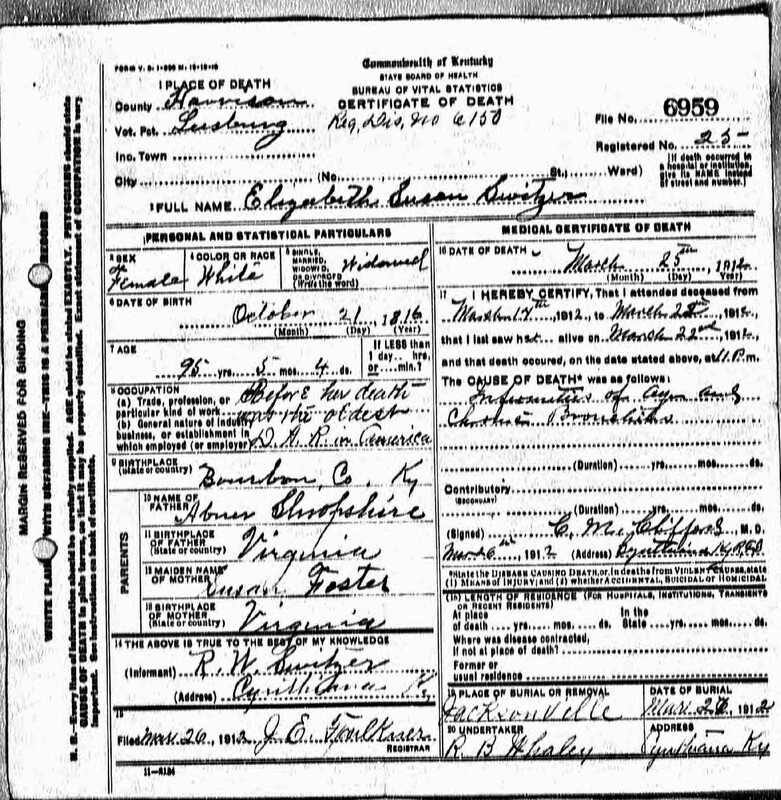 Elizabeth Susan Shropshire Switzer’s death certificate lists her as the daughter of Abner Shropshire and Susan Foster. 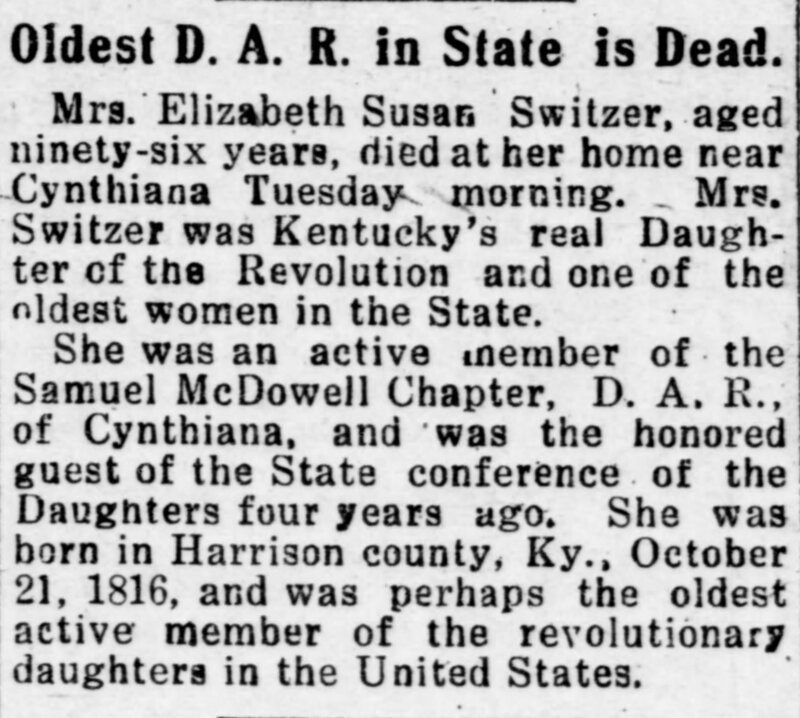 Elizabeth Susan Switzer died March 25, 1912, in Harrison County, Kentucky, at the age of 96. Just four years earlier she was one of the delegates at the State DAR convention and was the only real DAR member in attendance at the meeting. She was an active member of the Samuel McDowell Chapter, DAR, of Cynthiana. She was perhaps the oldest active member of the revolutionary daughters in the United States. She was buried at Jacksonville, Harrison County, Wednesday, after funeral services at Silas Church, of which she was a life-long member. 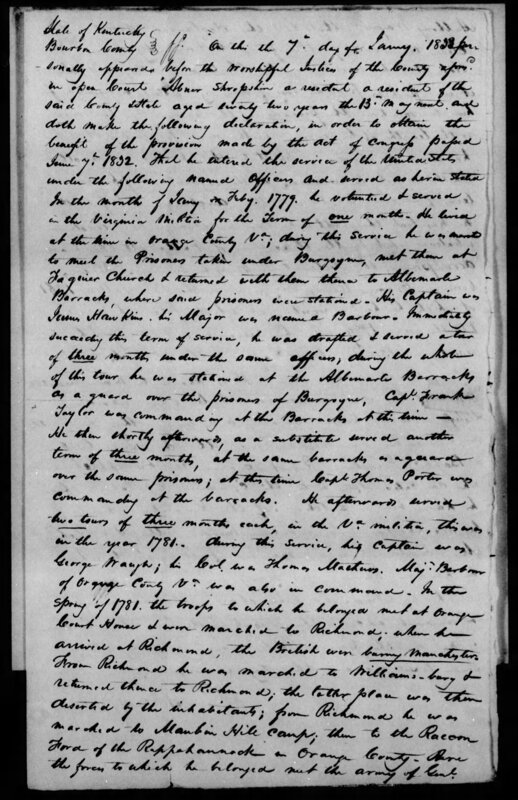 Chapter, Sons of American Revolution.